Hope everyone had a wonderful weekend! Thank you all for your kind words and sympathy during our time of loss. We truly appreciate your thoughtfulness and compassion. We can’t believe it’s our 100th post, how time flies! We have so much fun doing this, and we sincerely thank each and every one for the love, support and kind words – you guys are awesome!!! I adore this dress; my very close friend - D Joseph (an aspiring designer) gave it to me while I was in Nigeria a couple of weeks back. 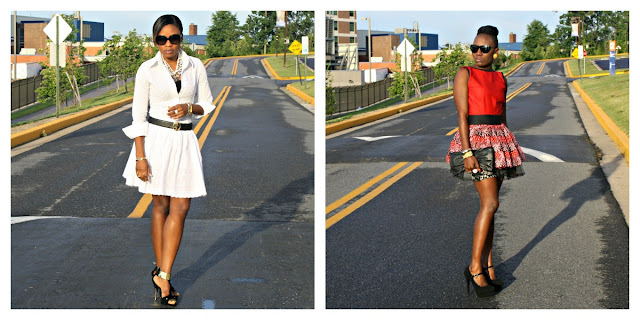 I wore the dress with a black & white F21 skirt. Jessica Simpson Shoes// Vogue Sunglasses//MK Watch//Jewelry –Dubai While we were away in Nigeria, we had our cousin make a couple of pieces for us – this skirt happens to be one of them. I’m sure you’ve noticed how much I love wearing shirts J so I had this made for me in three different colors. I am sorry for the loss the two of you experienced. Kola was a young soul and my thoughts are with his family. So sorry to learn about your time of loss. Just hope you're both are coping with it. Then, I'm glad that you guys are back, sharing your rocking styles with us! Have a great week, sweethearts! Your family members are so creative and talented I'm so jealous! Love all of these pieces! i hope everyone has been doing a little better in your family, you have been in our thoughts, but we are so glad to have you back! you girls never disappoint! Congrats on the 100th post, ladies. Looking beautiful as always. PS Hope you and your family are doing better during this trying time. Your friend/cousin is so talented! And generous! You both look fabulous. I'm glad to see you back - with your 100th post no less. Congratulations! Loving both outfits as usual and especially that red dress! Love both these outfits, you both look amazing! That dress is so COOL but I'm in love with that shirt and that skirt!!! Wow Love them!! Whoa, that bold red dress is amazing! Congrats on the 100 th post you beautiful girls! the metal detail on the sandals. very proud of you girls! You both look fabulous!! Love the heels and the accessories!!! sorry for your loss glad you ladies are back great post the looks are beautiful! Congrats on your 100th post! I love the designer dress--your friend is talented! It looks great on you! Love all the white too--so lucky to have those things made! Nice looks ladies! OMG. These are my 2 favorite looks by far. I love the white dress. It's so classic. The red one is super adorable. both fabulous outfits! cant decide which one I like better! You ladies have such impeccable style! Dammie I'm loving how you paired that F21 skirt with the custom dress...PERFECTION! Bisola I need those heels ASAP! Very chic looks! You both look great and style each outfit really well! wow congrats on your 100th post! you girls look super stylish here! Congrats with your 100th post! Love your heels! I'm really sorry about the loss you've suffered. May he rest in peace. I love the red dress too,so amazing! !